This blog is a fairly new venture for me considering I have been a Mummy for over thirteen months now. 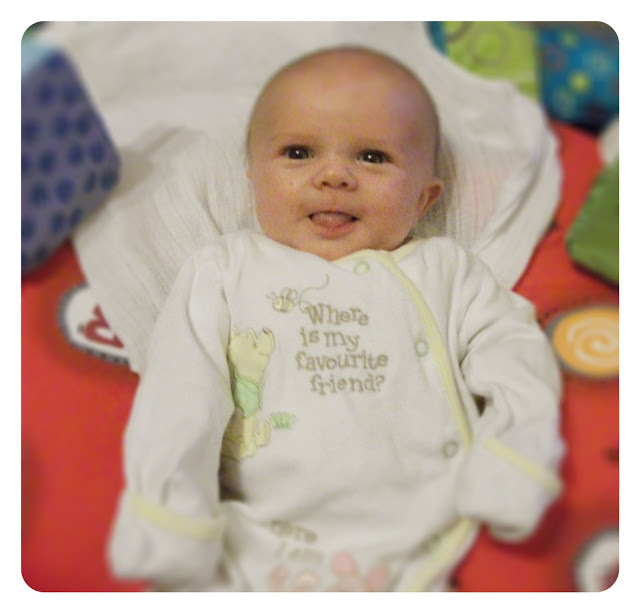 Although you will have seen loads of photos of my little boy now, you won’t have seen too many of him as a newborn. I wanted to share a photo of Lucas from this time last year. He would have been around 8 weeks old here and I remember it being one of the first photos I got of him looking like he was smiling, his first smiles. I just love this photo, he has got such a cheeky expression; he still has that look now, usually when he is running away with something he shouldn’t have! I look at this mischievous little face now and I can’t believe where the time has gone! It hard to see this tiny baby as the same toddler that is currently tearing round my house. I know when this photo was taken I was finding things tough, he wasn’t a good sleeper early on and the tiredness was really taking its toll on my sanity! However, when I look back at it now all I remember is how proud I was of my beautiful boy and that I’d do it all over again for the moments like this. I’m linking this to Mummy Mishaps and Real Housewife of Suffolk County. hee hee what a cheeky boy! gorgeous photo and he has beautiful eyes. it is amazing where the time goes with our children isn’t it? They grow so quickly before our eyes and i cannot believe how old my two are already. i love looking back on their baby photos too. Gorgeous photo. It is scary how quickly time passes with children. I know, I can’t believe this was a whole year ago!